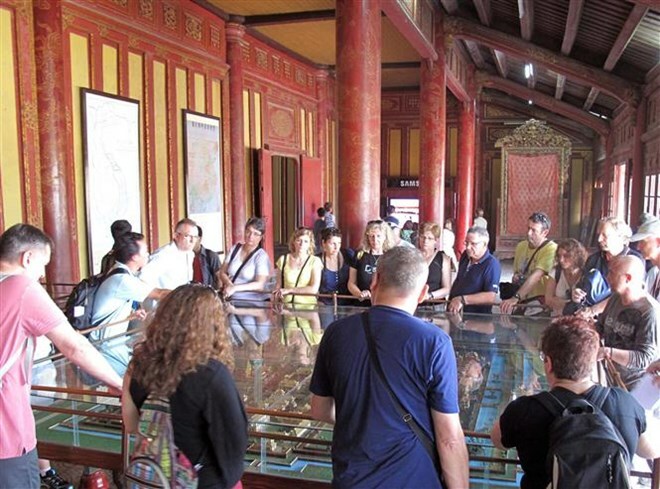 Thua Thien-Hue (VNA) – As many as 1.2 million domestic tourists and 1.5 million foreigners visited Hue imperial relic site in the central province of Thua Thien-Hue in the first eight months of 2018, according to the Hue Monument Conservation Centre. During the three-day National Day holidays alone, the site welcomed over 71,000 visitors, including 10,000 foreign arrivals. Director of the Hue Monument Conservation Centre Phan Thanh Hai said the “one destination, five heritages” tour mostly contributed to attracting visitors to the site. Recently, the illumination of “Ky dai Hue” (Hue flag tower) with 1,000 LED bulbs in connection with relic sites such as Nghinh Luong Dinh, Phu Van Lau, and Ngo Mon (South Gate), has created a highlight for the ancient city, especially at night. The Hue flag tower has becomes a symbol of heritage, attracting a large number of domestic and international tourists. In the future, the centre will continue to exploit the tour to Dai Noi (Royal Palace) at night that connects the Hue flag tower and the Royal Palace, as well as expand service activities for visitors, towards creating unique products to lure more visitors to Hue. Hai said the number of tourists to Hue has continuously increased, with the average rate of 15-18 percent per year. The site is expected to serve about 3.3 million holidaymakers in 2018. Notably, about 170 monuments in the heritage area have been invested for restoration and conservation, typically Ngo Mon, Thai Hoa Palace, Hien Lam Cac, The Mieu relic system, Dien Tho Palace, and Duyet Thi Duong. Many works in Gia Long, Dong Khanh, Trieu Thi, and Tu Duc tombs have been restored. Investment has also upgraded the relic site’s infrastructure, including the roads, lighting system, fire prevention system, and lightning protection.